Hot hatches scream youth. The current breed of compact hot hatches – Peugeot 208 GTi, Ford Fiesta ST, Seat Ibiza Cupra and Renault Clio RS – are the hooligans of the car world. I took a closer look at the new Peugeot 208 GTi to find out if there is more to it than just flared wheel arches and an aggressive body kit? The already sculpted and athletic body of the 208 has been enhanced in GTi spec by extended sills and wheel arches, chrome door mirrors, dramatic 17” inch alloys with red brake calipers, roof spoiler, double exhaust, and the famous GTi badging. It sits lower than a standard 208 and has a wider track front and rear. The GTi gets a unique chequered flag effect grille and lower grille finisher in red. The test car looked like a 208 supermini that had put its black sunglasses on (see it here) and it had the shady character to go with it. Inside there is a red and black theme with special touches like footwell lighting, aluminium pedals and door sills, and sporty looking instrument dials surrounded by red LEDs. 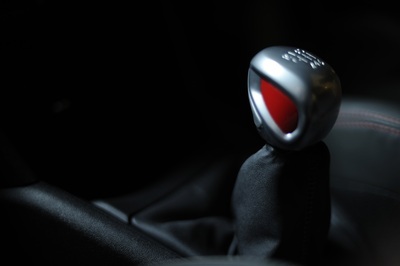 Sports seats hold and cosset you for those days when you drive your 208 GTi with more vigour than maybe on the daily commute. It’s three door only so there is a slight trade off in access and rear headroom. The 208 GTi has a standard supermini sized boot of 285 litres and a full size spare wheel, but to spend too much time dwelling on bootspace would be to miss the point of this car. 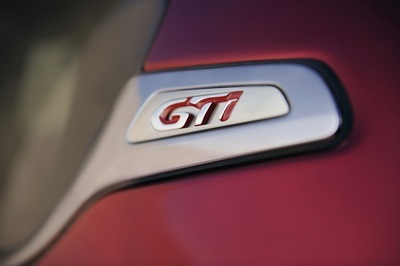 Turn the key in the ignition of the GTi and you are treated to a bass rumble. Underneath the bonnet is a 1.6 litre turbocharged powerplant producing 200bhp. When you put your foot down the hooligan persona kicks in and the 208 GTi will sprint to 100kmh in 6.8 seconds. With 275Nm of torque it will pull hard through the gears, accompanied by a fruity grunt from the exhaust. It’s not quite noisy enough and overall lacks a bit of rawness that might put some hot hatch purists off. Still it’s fun extracting the power from the engine through the slick shifting gearbox. The handling is A1 with loads of front end grip and the small steering wheel feels great in the hands. You put your foot down and it goes in a straight line. It’s comfortable too as a daily car so no lurching over bumps in the road and then getting out of it after a long journey with a sore back. 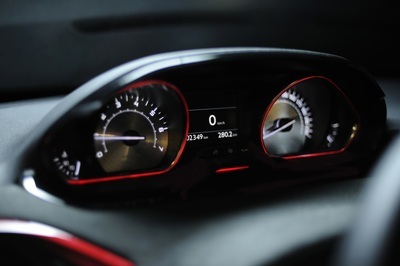 The 208 GTi also follows the trend for more efficient hot hatches with an official economy value of just under 50mpg – but a heavy right foot will seriously diminish fuel economy. At just over €28,000, the 208 GTi is a little bit of an indulgence. You do get lots of kit including a 7″ touchscreen with Bluetooth connectivity, dual zone air conditioning, cruise control and speed limiter, fog lamps, rear privacy glass, electric windows and electric folding mirrors, auto lights/wipers, remote central locking and LED daytime running lights. 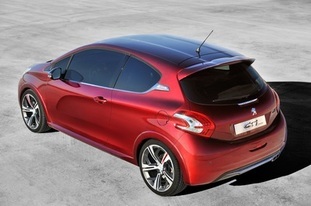 The 208 GTi is utterly transformed from the 208 hatchback it’s based on. It’s a blast with the extra grip, a stiffer body, while still being a car you can live with quite easily from day to day. It’s not a boneshaker. You’ll never get tired of the strong torque from low revs. I just wish it were noisier! This car has a great image and pedigree going back to the days of the 205 GTi, and with sporty exterior updates, it has real kerb appeal too.